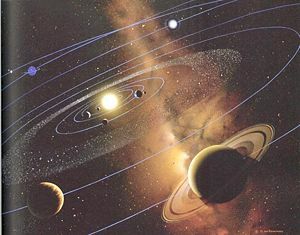 Sol is a star system in the Sol Sector comprised of eight planets orbiting a G2 main sequence star. The third planet of the Sol System, Earth, is the homeworld of humanity and the very core of the Terran Confederation. The Sol System is the capital system of the Terran Confederation and among the most populous of the Terran systems. It is the administrative center of both its government and its military. Earth is home to the President of the Terran Confederation, who resides in Washington, D.C. of the present-day United States. Various space stations designed to accommodate humanity's basic needs and the Confederation Space Navy are spread all across the system, most notably the Terran Confederation Headquarters orbiting Jupiter. Colonies and production facilities were built across the surfaces of most of the other terrestrial planets. The Sol System was of vital importance during the entire course of the Terran-Kilrathi War. The Terrans knew that the Kilrathi would win the war if it was ever allowed to conquer Earth, so it was the Space Navy's top priority to ensure that the Kilrathi never infiltrated the system. Thus, it was likely the most heavily-fortified system in the Terran Confederation. The Sol System was breached in 2668 when a massive Kilrathi fleet smashed through the system's defenses and attempted to attack Earth. All surviving Terran warships rushed to Earth to ensure its survival. These events culminated in the Battle of Earth, which saw the defeat of the Kilrathi Empire that day, but left the Space Navy in ruins and millions dead from orbital bombardment. In 2669, the Kilrathi intended to strike Earth once again, this time using a larger and more modern fleet. Given the state of humanity in that year, Earth would not survive another attack. Colonel Christopher Blair covertly delivered the Temblor Bomb to the surface of the Kilrathi homeworld of Kilrah, destroying the Kilrathi Empire a mere two days before the planned assault. The war ended in a Terran victory, ensuring the safety of Earth. After the war, the Sol System found itself in a brutal post-war recession as soldiers retired from active duty in the thousands and the economy lost the need to fund such a large military. The government authorized the minimization of the Confederation Space Navy and proceeded to dismantle its obsolete fleet. The economy then returned to serving domestic needs. The Sol government nearly voted for war against the Union of Border Worlds in 2673 when the Black Lance attempted to instigate war between the two factions. This war declaration was prevented by the intervention of Border Worlds forces who exposed the conspiracy. The next eight years saw a long-awaited peacetime come to Sol. However, this peace was threatened in 2681 when the Nephilim invaded the Sol Sector. Humanity's new and improved fleet was deployed to prevent them from invading the home system. At present, the system remains safe from Nephilim forces. This page was last edited on 11 May 2012, at 16:40.